My GF Vicky just returned from a trip to the Philippines, assessing various sites for a retirement home. She brought back a strand of enormous, multicoloured pearls. Our original plan was that she'd buy strands for both of us, but, unable to e-mail me photos as we had discussed, she wisely bought one necklace that she liked. She offered it to me if I wished, and she'd have the dealer send her a second strand. However, when we both tried them, appraising the effect before her mirror, it was clear as the Palawan waters that they were meant for her. She's a peach-toned light brunette, and these pearls caressed her, reflecting their glow to her face. I look better in cool tones. A closeup of her chocolate, gold and cream gems show their size and varying shapes; click on the photo to get really close. I've heard the shapes described as 'bread', 'button' or 'very off round'; Vicky says they're baroque. Who cares, they're gigantic! Though you could wear them with a cocktail dress, Vicky playfully pairs them with a sweater, corduroy pants and driving moccasins. When I swooned over them as we ate pad thai, she offered them to me again, such a generous friend! On her next trip, she'll return to the same dealer with that in mind. She's honed her bargaining skills through trips to Thailand, Vietnam and Myanmar over decades; she is careful to establish a respectful relationship she can maintain for years. The result of Vicky wearing her pearls so stylishly is that friends are begging for similar strands, so she will buy multiples when she's in Manila in the fall. I suggested she expand her business (antiques and interior design), to pearl-importing! 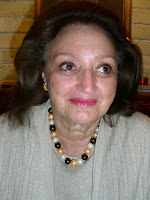 A true bonne vivante, she's also cooked some my sons' most memorable meals. Before she and her dashing husband Patrick retire to Asia, I long for one more feast of her inimitable cous-cous royale. Those are really lovely. I love pearls. She sounds like a lovely and interesting friend. Love the colors she chose. Those are gorgeous and so unusual. She has great taste! Vicky looks like those were custom made for her coloring. See if she can find the same ones only with pinker pearls replacing the peachy ones she has on her strand...Gorgeous!! Karen: That's exactly what I've asked for! I'm sure you have heard from many, many online friends- xoox. Pseu & Julianne: Terrific taste, and she has advised me. She's also wildly funny. 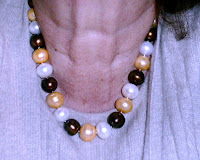 Gorgeous - make her get you a strand of beautiful pewter and pink pearls next time!